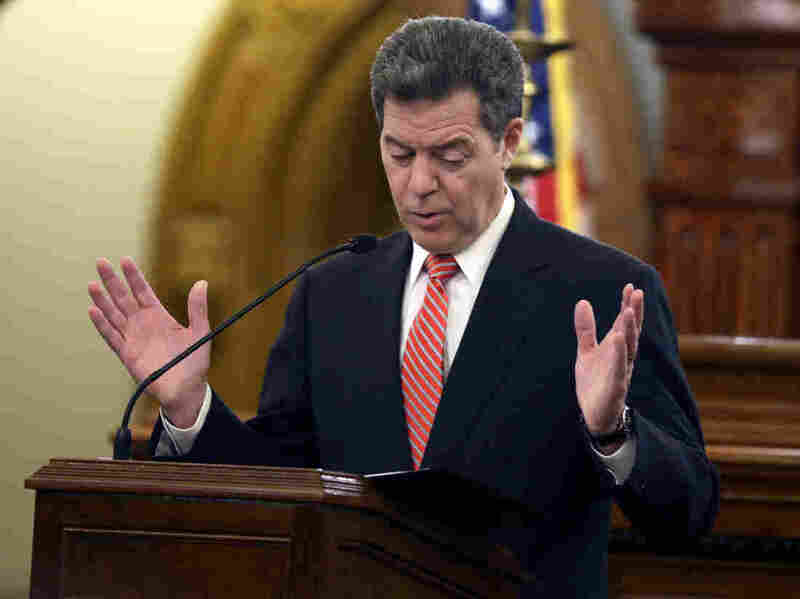 Kansas Will Cut Education Funding To Help Close Budget Gap : The Two-Way Republican Gov. Sam Brownback, whose aggressive tax-cutting measures helped trigger the financial crisis, said the schools' funding levels are unsustainable. Gov. Sam Brownback delivers his State of the State address at the Kansas statehouse in Topeka last month. Brownback has announced cuts in education to plug the state's budget woes. Kansas Gov. Sam Brownback says he will cut funding for public schools and universities in a bid to keep the state solvent through June after aggressive tax cuts left gaping budget shortfalls. Kansas public schools will lose 1.5 percent across the board, while the state's regents universities will see budgets trimmed by 2 percent. The estimated savings of $44.5 million would be used to help prop up the state's finances. The move, combined by a budget-balancing bill approved by the GOP-controlled legislature, would fall just short of eliminating a $344 million deficit. Even so, a $600 million shortfall is projected for the next fiscal year, which begins July 1. "The dramatic increase in state education funding that has occurred over the last four years is unsustainable," Brownback said in a statement released Thursday. "School districts are estimated to have approximately $381 million in reserve fund balances to help them offset the smaller than expected increase in state funding. The Kansas Department of Education should work with school districts to help them with any cash flow challenges that may arise." In May 2012 Brownback, a Republican, signed into law the state's largest-ever income tax cuts, which helped trigger the budget crisis. The Wichita Eagle reports that his decision to cut education spending to close the budget shortfall "has sparked anger from some lawmakers and education advocates after his previous promises to safeguard education funding." "Brownback's Kansas experiment was hailed by some national conservatives in 2012 and 2013 when he championed personal income tax cuts to stimulate the economy, dropping the top rate by 29 percent and exempting 191,000 business owners altogether. Revenue has since fallen short of forecasts, and Brownback won a closer-than-expected re-election in a heavily Republican state last year after arguing that the tax cuts would not hurt schools or sacrifice core government services. "Some Republicans have backed away from using Kansas as a tax-cutting example now that the state faces a fiscal crisis."